Global Cancer Biomarker Testing Market: Biomarker is any of body molecules that can be measured to assess the health. Molecules can be obtained from, body fluids, tissue or blood. Biomarker testing is also known as genetic testing or molecular testing. Biomarker test is a group of tests that look for these molecular signs of health so that doctors can plan best care. Cancer is referred as abnormal growth of the cells. Cancer biomarker is a process or substance that indicates the presence of cancer in the body. Genetic, epigenetic, glycemic, proteomic, and imaging biomarkers are used for cancer diagnosis, prognosis, and epidemiology. These cancer biomarkers used as risk indicators for various types of cancer such as lung cancer, breast cancer and prostate cancer among the others. Key cancer biomarkers include SCC, CEA, NSE Cyfra 21, PSA (prostate cancer), TPA (Lung cancer), CA15-3, EGF R, Cytokeratin 4 (breast cancer) and BRCA ½. The cancer biomarker test market is driven by rising prevalence of cancer worldwide. World Health Organization (WHO) stated that cancer is one of the leading causes of mortality and morbidity worldwide, with approximately 14 Mn new cases in 2012. The number of new cases is expected to rise about 70% over the coming 2 decades. In addition, increase in awareness in public and healthcare professionals regarding early diagnostic procedures, rise in government and NGO’s funding for oncology are expected to bolster the cancer biomarker testing market. Furthermore, the development of companion diagnostics and recent breakthrough in detection techniques such as proteomics, metabolomics, genomics and transcriptomics are further expected to boost the cancer biomarker test market. However, high cost for biomarker tests, low detection rates and regulatory policies are expected to hamper the cancer biomarker test market. The global cancer biomarker testing market is expected to grow with significant CAGR during forecast period. Market players are carrying out collaborations, partnerships, and acquisitions as key development strategies to enhance the market share. For instance, in March 2017, Foundation Medicine and Bristol-Myers Squibb entered collaboration to understand tumour profile and its microenvironment to predict patient’s response to cancer immunotherapy. Using Foundation Medicine’s foundation genomic profiling assay, the firm will look at tumour mutational burden and microsatellite instability in patients enrolled in clinical trials for Bristol-Myers Squibb (BMS) cancer drugs. For instance, in October 2016, Arquer Diagnostics Ltd. (Arquer), and University of Sunderland are collaborated to investigate noninvasive specimen preparation techniques that will facilitate the use of Arquer’s MCM5-ELISA test in a wide range of cancers. In April 2016, Stemcentrix acquired by AbbiVe along with its lead late stage biomarker rovalpituzumab tesirine (Rova-T), that helps to identify tumour cells. Geographically global cancer biomarker testing market segmented into following regions viz. North America, Europe, Asia-Pacific, Latin America, and Middle East & Africa. 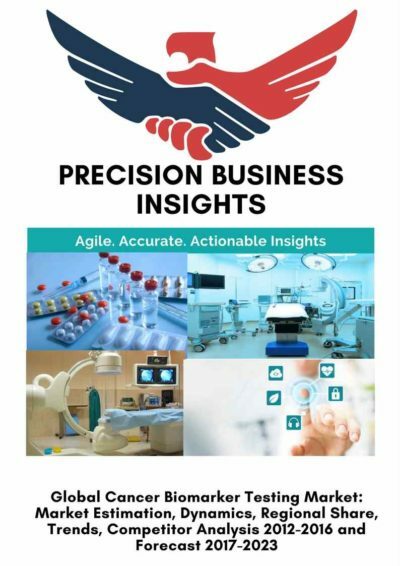 North America is expected to be a major market for cancer biomarker test market owing to increase in research and development activities to diagnose and treating cancer and rise in prevalence of cancer. According to American Cancer Society (ACS), in 2017, it estimates 1,688,780 new cancer cases are diagnosed and 600,920 cancer deaths in the U.S. alone. Asia-Pacific cancer biomarker test market is expected to be fastest growing market due to increase in demand for the non-invasive techniques in diagnosis and prevention of cancer, high prevalence of cancer conditions in the region. 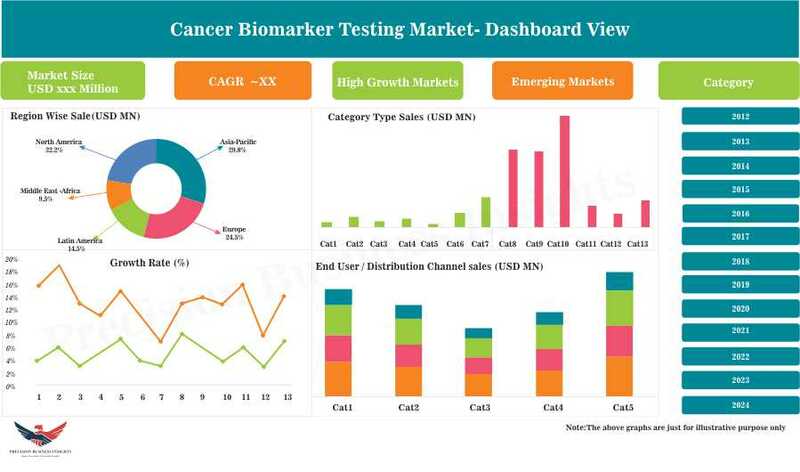 Some of the players in cancer biomarker test market are Thermo Fisher Scientific (Affymetrix Inc.) (U.S.), Abbott Laboratories (U.S.), F. Hoffmann-La Roche Ltd. (Switzerland), AbbVie Inc. (U.S.), Arquer Diagnostics Ltd. (U.K.), Illumina, Inc. (U.S.), Qiagen (Germany), Agilent Technologies (U.S.), Merck & Co. Inc. (U.S.), Becton Dickinson and Company (U.S.), and Hologic Inc. (U.S.) to name a few. In 2015, Abbot Laboratories acquired exclusive rights for FGFR3 gene mutations to detect bladder cancer. FGFR3 developed at Institute Curie, it is a gene mutation and useful for early detection, disease monitoring, and prognosis of bladder cancer through tissue and urine-based testing.